Forty-two Poggers battled it out over four Swiss preliminary rounds followed by two final rounds in the Guns of August Pre-Con action preceding WBC. A total of 78 games were played with few players leaving early before WBC even got under way. The rules were a standard campaign game with the placement of AH and RU corps in Stanislaw and Lutsk to prevent an early "Dance of Death" on the East front. The bids of VP given up to play the Allies ranged from zero to three with 43% of the games bid at two. The average Allied bid was 1.55. Although this tournament allowed the offer of Peace Terms, only two games actually saw offers, with no acceptances. strategy was fairly common as well. Rob Hassard emerged as the POG champion, wining all six of his games. Tom Drueding, Marvin Birnbaum, and relative newcomer/shark Steve Worrell finished in the other top spots. The semi-final game between Drueding (AL bid of 2) and Worrell saw trade-off defeats of Turkey and France but an eventual concession by Steve to Tom's combined eastern armies of RU, SE, IT, BR that finished off the AH. 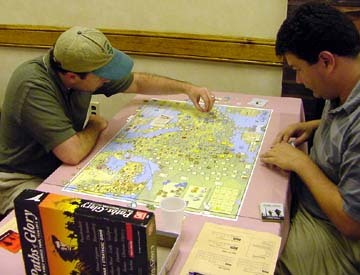 Despite the accepted use of the Defend the Rhine strategy, Steve had success in several of his games with a strong "Blitz the French" attritional strategy. In the semi-final game between Birnbaum (AL bid of 3) and Hassard, Rob's CP also opened with a strong Western attack, eventually forming a line from Bar-le Duc up to Sedan/Aachen. Although Italy was a quite front, there was much action in the Near East and in Russia. Rob's CP forces took Basra and were able to hold the line in the East to Marvin's expert play, garnering a CP win with VPs in the16 range after bid. Hassard (AL bid of 2) fought an exhausting ten-hour finals match against Drueding. Italy was a decisive theater with Tom marching four German and three AH armies into the boot. Despite the Allied reserves rushed to Italy, the country was soundly defeated except for a sole flipped Italian corps. This corps in exile managed to fulfill five IT MOs during the rest of the game.